Curvaceous and well padded, the Red Eclipse bar stool reaches unparalleled levels of comfort in a stunning design. The graceful arc of the backrest, which descends to meet the edge of the seat on either side, gives the Eclipse a sense of dynamic movement, which is enhanced by the fiery red faux leather covering. The seat is generously padded, providing great comfort and support. 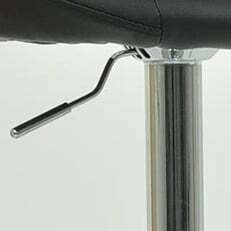 A gas lift mechanism allows the height to be adjusted up to 20cm and the seat rotates through a full circle as required. An oval footrest is attached to the central support column, which terminates in a circular base, reflecting the circular shape of the seat. The lower section is finished in shining chrome and a useful floor protector is included below the base. Vibrant red and glossy chrome make the Eclipse a bar stool that will not be overlooked, creating a strong focal point at any bar or counter.